LATEST FAST TRACK NOTES FOR MAY AND NOVEMBER 2015 EXAMS. IN EXTREME SUMARISED AND EASY TO LEARN FORM. It is found that some candidates while filling the examination application form (either online or physical ) do not exercise reasonable care and commit errors and seek change of Centre/Group/Medium, on account of errors committed by them in their examination application forms, after submission. With a view to provide an opportunity to the candidates to correct such errors made by them while submitting their examination application forms, it has been decided to put in place an online facility to view and correct errors if any, committed by them while submitting the examination application form, in the fields of Centre/Group/Medium, (i.e. for seeking change of Centre/Group/Medium), with effect from May 2015 examinations. • Manual applications seeking change of Centre/Group/Medium will not be entertained. 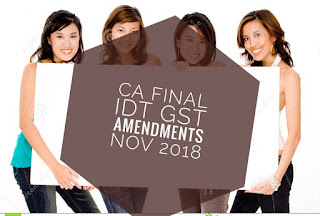 • The on-line window for seeking change of Centre/Group/Medium will made available at http://icaiexam.icai.org. • This online facility will be available to the candidates, in two separate sessions. The first opportunity (called “Correction Window”) will be free of cost and the second opportunity ( called “Corrections with fee-Window”) will be for a fee of Rs 1000/- . • Candidates will be able to check the status of their request for change of Centre/Group/Medium from the above-mentioned website. "Correction Window" is a platform in the exam form submission process, where candidates can view and correct errors, if any, committed by them while submitting the exam form, in the fields, Group Applied, Centre opted and Medium. 1. This facility is available at http://icaiexam.icai.org, from 11.00 a.m. of 10.03.2015 to 5.30 p.m. of 16.03.2015. 2. This online facility will be available to the candidates who have submitted their examination application forms online as well as to those who submitted physical examination forms, i.e. OMR forms. 3. This window is not for fresh submission of exam forms and is meant only for correction of errors if any, in the exam forms already submitted. 5. Following details, submitted by the candidates in their examination application form will be displayed on the screen. Candidates will also be permitted to change the Group opted, i.e., from single Group to both Groups and the Centre opted, i.e., from an Indian Centre to Overseas Centre and pay the differential examination fee online through the payment gateway, through this "Correction Window". 7. A change may include change of Group/Centre/Medium either jointly or severally. ONLY ONE ONLINE APPLICATION FOR A BARCODE / CONTROL NUMBER WILL BE ACCEPTED. PLEASE APPLY CAREFULLY. 8. Candidate will not be permitted to make any corrections/changes to any other field. 9. The requests should be made by the student and not by anyone on his/her behalf. 10. Once you click “No change required”, no corrections can be submitted thereafter. So also, corrections, once submitted, cannot be changed thereafter. 11. The facility will be available free of cost except for differential examination fee, if applicable. 12. The candidate should upload scanned copy of a handwritten application in this regard, duly signed by him, seeking the corrections required. Unless this condition is complied with, the candidate would not be able to submit corrections sought, online. The changes requested will be taken from what is applied thru the portal and not what is written in the scanned application. 14. Admit cards will be issued based on the examination application form and the correction received till the Correction Window closes. THESE ARE AS PER ICAI. FROM HERE YOU CAN DOWNLOAD IPCC EXAMS LAST 7 ATTEMPT EXAMINATION PAPER WITH SOUTION. THIS DOCUMENT CONTAINS EASY AND CREATIVE WAY OF LEARNING CLAUSES OF AUDIT REPORT UNDER SEC 44AB.